Sometimes I start sewing without much of a plan, and it either turns out amazing…semi-cool…or pretty horrible. I’d give this one a rating of semi-cool and growing on me. It’s very busy with all those prints crammed into one table runner! I did this swirly quilting on it and it was really fun once I got the hang of it! I wrote in this post how I made the pinwheels. The sizes of pinwheels were 8 1/2″, 4 1/2″ (trimmed down from 5″), and 6 1/2″…then I sewed 2″ strips to 2 sides of the 6 1/2″ to make the block 8 1/2″ square. I love the look of it on my table…but between art projects and experiments it will probably spend very little time there! I really like how your table runner turned out! Love the table runner. I think I will make one with a similar layout. The only problem is that my table is usually covered with fabric. Oh well. Your Tablerunner looks so beautiful with all those fabrics and different sizes of pinwheel blocks. Well done! I love the table runner! 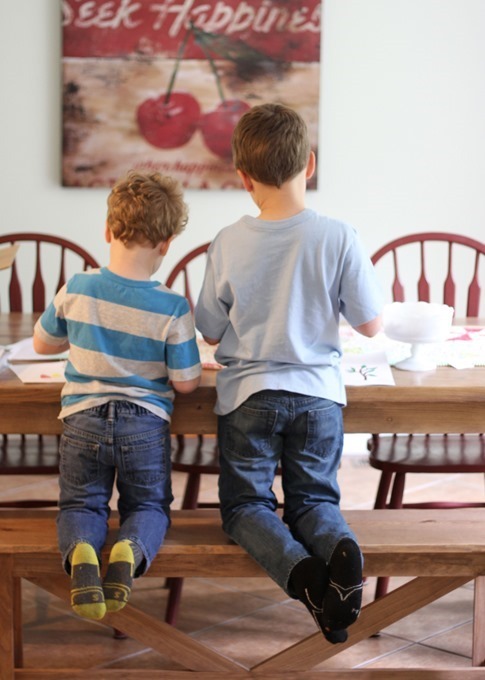 But like at your house, a table runner seldom stays on the table and is usually crumpled in the corner or on the floor to make way for boy's projects, coloring books, blocks….Ah well. Interestingly with lots of the 'busy-ness' being in neutral tones it calms the design down considerably…it's gorgeous! Oh I love that tablerunner and especially love two of the prints you used in it… the houses print and the numbers/year print. It definitely rates at way more than "semi-cool" in my book. I love it! I think amazing is a good description. This is great and not at all what I'd call "busy". It's fun and very cool! I think it is absolutely amazing and beautiful! Love the new line of fabric. I like it when something turns out as cool. Fun fabric in your table runner. I Pre-ordered "growing up modern" months ago and it came in the mail today from amazon. I love it. I love it. The projects look fun, satisfying and will show off some fabrics I have been hoarding perfectly. :) I have completed two of your quilts in the past- I seem to always just love your sophisticated, yet simple style. So I knew I would simply "need" this book. :) congrats- its beautiful- Projects, quilting & photography!! You are way too modest…it's amazing! Looks great! I always love pinwheels, especially with lots of color. So classic and fun at the same time. Well done. I love the look of it on your table, and the swirly quilting is cool. Great shot of the little boys! I love your quilt. The colors are great! I like it, looks wonderful. The quilting is beautiful. 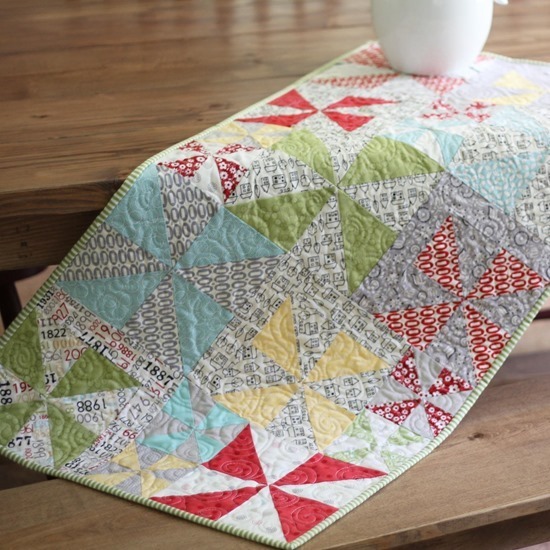 Your table runner is beautiful! 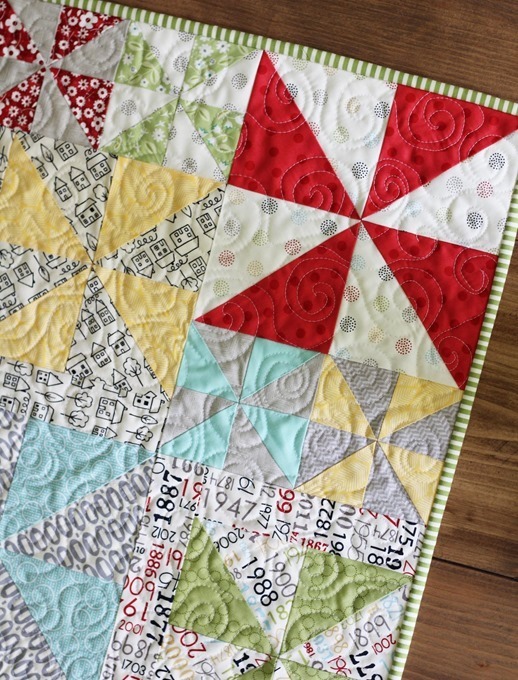 I'm inspired to have a go at some swirly quilting (thanks to your great photos I can clearly see how to do it!). Lovely tablerunner you made! Looks very sunny. Wish I were going to Spring Market! Portland is a long way from Ardmore, OK ! And I've never been there. I'm sure it's beautiful! I will look for you at market! Compared to some projects I've seen, I don't think this even approaches "too busy" – I think it's just energetic. ;) It's really fun and looks great! 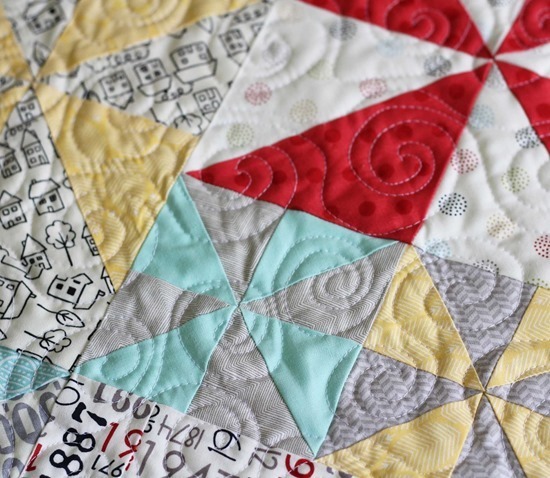 I love your quilted spirals! I've been working on that one and still haven't been able to get my spirals quite as smooth and even as yours. And I like your "semi-cool" table runner! Just gorgeous. I love the idea of making quilts, one day I will be brave enough to have a go & make something substantial. For now I will just continue to watch. Absolutely adorable! I love how it looks on your new "farmhouse" table. Super jealous! You are too hard on yourself! It is not that 'busy'! Lovely. I like the swirly quilting. It's a really pretty table runner! I need to start collecting the written fabric. It makes a wonderful pattern. My, you are good!! And this picture sure does show how much your boys are growing! I love your tablerunner! It is pretty and fun. I'm a sucker for pinwheels. They always look happy.